This is a sponsored post for Shamrock Farms. All opinions are honest and 100% my own. 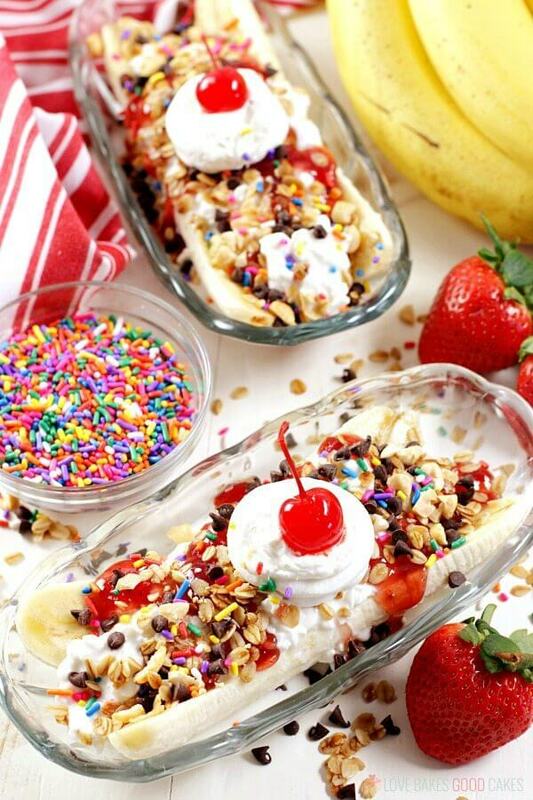 Breakfast is anything but boring when this Easy Breakfast Banana Split recipe makes an appearance! Cottage cheese naturally provides the healthy protein you need to power through the day. Sometimes, you have to shake up the boring breakfast routine and try something a little bit fun, but still on the healthy side. 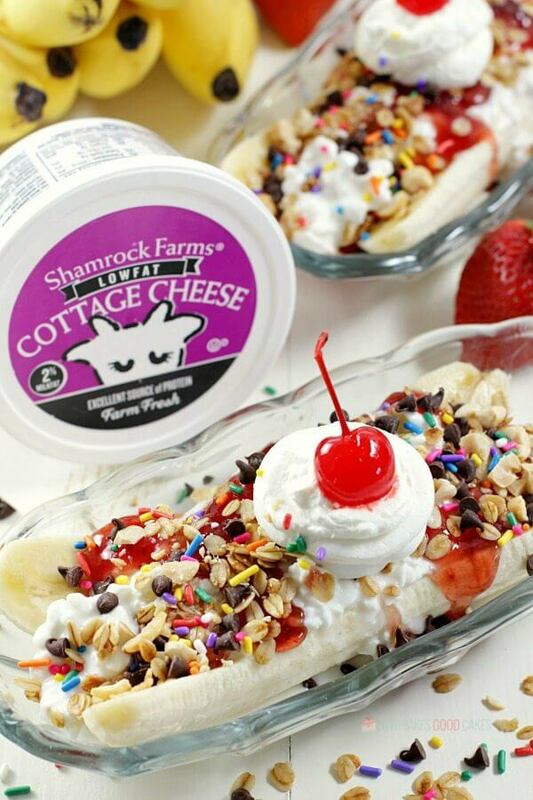 This Easy Breakfast Banana Split recipe is the best of both worlds. 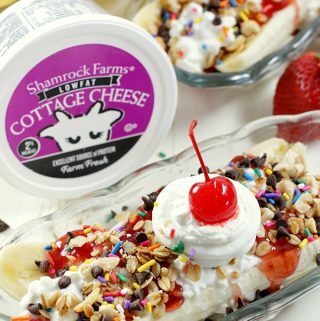 For the past two weeks, my kids have been talking about how much they want banana splits and it got me thinking about this recipe. I decided I would keep some of the fun banana split toppings but swap some of the others for healthier options. And give it to them for breakfast. Major mom points, there! Of course, you can totally make this healthy with just a few ingredient swaps. I started with a base of bananas and cottage cheese ….. yes, cottage cheese! It is a great way to sneak in some protein-packed dairy! 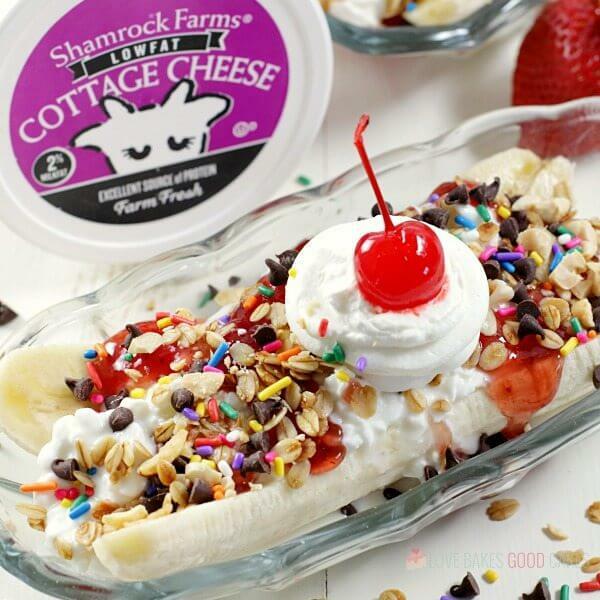 When it comes to dairy, I love Shamrock Farms products. 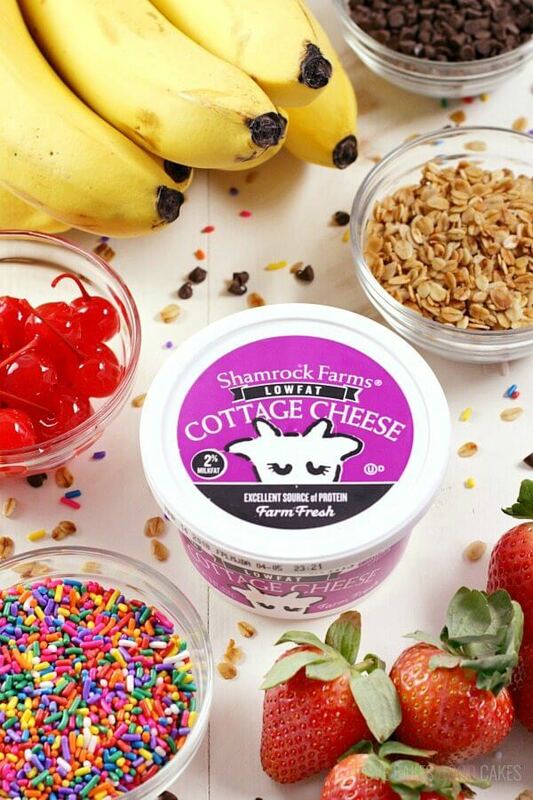 Shamrock Farm cottage cheese provides 13g of protein along with being low in calories and fat. And since my kids are still growing, it also provides the bone-building calcium they need. We love to use Shamrocks Farms is so many of our favorite recipes. It has a smooth texture and taste that is perfect for sweet or savory recipes! I use it in some our family-favorite recipes like lasagna and quiche – and I’ve been known to sneak it in smoothies! Every Shamrock Farms product begins with pure, wholesome, nutritious milk with no added growth hormones. All Shamrock Farms products go through rigorous purity testing and they are crafted using a hands-on approach that has been refined for three generations. Plus, all products are cold packaged and shipped to arrive fresh, fast, and delicious. Be sure to check out Shamrock Farms real working dairy farm that is open to the public for tours from October – May. You can see firsthand their commitment to high-quality animal care that keeps their cows happy and healthy. Place the split banana in a banana split boat or serving plate. Top with cottage cheese. Drizzle spreadable fruit over the top. Sprinkle granola, chocolate chips, peanuts, and sprinkles over the top. Garnish with a dollop of sweetened whipped cream and a cherry. For an even healthier option, omit sprinkles, sweetened whipped cream, and cherry. Increase granola to 3 tbsp. Add fresh fruit, if desired.